Who do I call when I need my couch, sofa, loveseat, sectional, recliner, chair, chaise lounge etc. cleaned? Most carpet cleaners can do the job. Make certain they are IICRC trained and certified as an upholstery cleaner, and also in advanced spot and stain removal. Also make certain they have a top-notch truck mounted steam cleaner that gets above 212 degrees and can be adjusted as low as 200 pounds per square inch water pressure, with a quality upholstery tool. Also, make sure they offer the dry foam method in case it turns out you need that or a variant of that crossed with the vacuum of the steam cleaner. Then ask if they offer satisfaction or your money back guarantee and if they are licensed, bonded and insured and if any of their technicians have ever been arrested. Just like you clean your sheets and bedding, upholstered fabrics need cleaning too. But unlike most bedding that can easily be laundered in your washer & dryer, upholstered fabrics often need special treatment, so the cleaning does not affect the fabric surface. Fabrics sought after and used, made all over the world and produced in a variety of ways, can react with cleaning in a manner that causes bleeding, shrinkage, distortion, or even alters the look and feel of the fabric surface. In an example, some fabrics have natural dyes, which easily bleed. Some have texture additives, like the cotton pod that is blended in the fiber surface (creating a vanilla bean fleck look) that when exposed to moisture will release dye from the pod the moment it gets wet. Other fabric textures, like velvet or corduroy, will become coarse and stiff when exposed to moisture. The key here is to evaluate the fabric, identify the fiber characteristics and plan the cleaning according to how the fabric responds effectively with little or no disturbance to its overall integrity. To explain a little further, each fiber has peculiar performance characteristics. Professional cleaners know these characteristics and plan their cleaning accordingly. For instance, nylon, a universally popular fiber, has many positive performing aspects to it and is widely used in upholstery manufacturing. Other synthetic fibers may be used, such as polyester, rayon, and olefin. Each having different behaviors, some resist water-based soiling better, some perform poorly when exposed to water, others when exposed to oil-based spills. All need care and attention. On the natural side, cotton and wool have yet other behaviors consistent with their fiber structure. You Wouldn’t Sleep On Sheets That Haven’t Been Cleaned in Six Months Would You? Then why would you let your upholstered fabrics go months or years without cleaning? Something to ponder- You have a teenage boy who spends a couple of hours playing basketball, shooting hoops, having fun and getting all sweaty with his buddies. Switch gears- the boys decide to head inside to play video games. . . only to flop, drop and plop on your comfy sectional in the family room. Dialing it down, these boys (not gender skewering per se) just by their movements wipe their sweat all over your poor upholstered fabric, leaving it helplessly smeared with sweat and stench. Again, you wash your sheets that get succumbed to body soiling, but because the upholstered fabric does a better job of hiding the soiling, dirt, and sweat, cleaning it even somewhat regularly is usually overlooked. Doesn’t it make sense that if the fabrics can be cleaned successfully, that they should? Of course. But how do you know you will get proper cleaning? What credentials and skill set does the professional cleaner have that will assure that the cleaning they provide will clean effectively without causing damage to the fabric? It cannot be stressed enough that upholstered fabrics are made all over the world, dyed in a variety of ways, and with so many different fabrics. Frankly, the fabric is pretty vulnerable at the very least. TRAINED AND CERTIFIED Upholstery Technicians can test the fabric, alter the cleaning, and clean the fabric in a manner that cleans effectively, but also protects and preserves the fabric and piece. You do yourself no favors if you use and hire someone who is not certified to handle fine fabric care! The moment anyone, certified or not, touches the fabric with the intention of cleaning is taking a risk of causing damage. It is just that simple. Furniture is made with little regulation, and cleaning pre-disposes the fabric of being damaged at the very moment someone begins to try and clean it. It is amazing that folks unsuspectingly will fall prey to the ridiculous pricing for upholstery care merely because the coupons they are subjected to water down proper upholstery care. A coupon for $49.99 for a Sofa cleaning should sound an alarm, for sure! It takes over an hour to properly hand shampoo a piece of upholstery, let alone gently mist to extract it. When seeking out a company to work with, look past the coupons and make sure the person at the wand (or upholstery tool) belongs there. 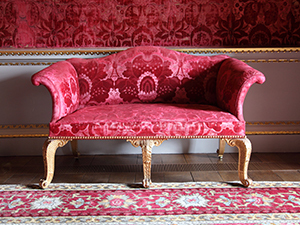 Absolutely any time upholstery is cleaned there is distinct chance damage can occur. You are investing in and protecting your furniture & decor when you work with a professional trained in working with the very fabric you hire them for. Again, it cannot be stressed enough the importance of cleaning, cleaning properly, and cleaning with someone skilled to do it right. Do Not Remove the Cushion Covers & Throw Them In the Washer! As fast as you get them off and into the washer, you can ruin them- It is not worth the chance! To sum things up, fine fabric care does protect and preserve the integrity of the piece you most likely treasure. Upholstery in general hides dirt really, really well. And likewise, it harbors germs and holds on to dust particles, chemicals, and other nasty stuff. Cleaning and sanitizing has a positive impact on appearance for sure, but also on the health and wellness of folks living in the home. Call us for a competent and professional program for cleaning- you will benefit, and certainly, the prized possessions and decor will as well.